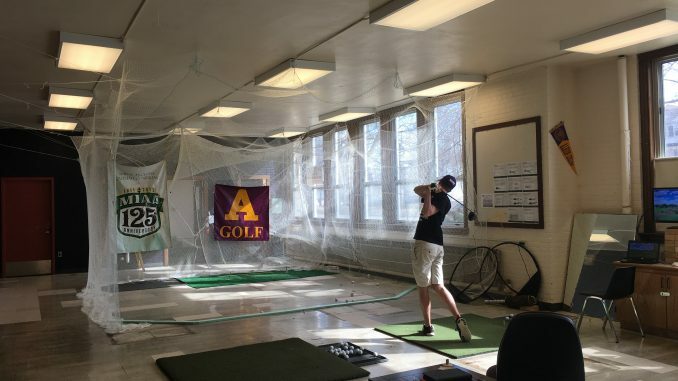 After years of searching, Albion College’s golf teams now have enough space to use their equipment to its highest potential. The teams have recently moved into their own space in the new Washington Gardner workout facility. This new area includes two offices, a student lounge and two hitting bays. One of the most valuable parts about this new facility is the ability to use the FlightScope Xi Tour program, which reads ball flight and speed, and it simulates rounds of golf based on the data. Head Coach Jordan McArleton is thrilled the teams have this new space. McArleton believes this new facility will improve the teams, especially in the spring semester, because it will make practice more accessible for the players. Previously, the golf teams practiced 20 minutes away at the Medalist Golf Club in Marshall. With all of these updates, McArleton says that there is still more to come. He hopes that in the near future, the team will add another launch monitor, a bigger TV and a putting green. If any student, faculty or staff member would like to use the new facility, they can sign up for a time slot on Go Brits under Facilities.